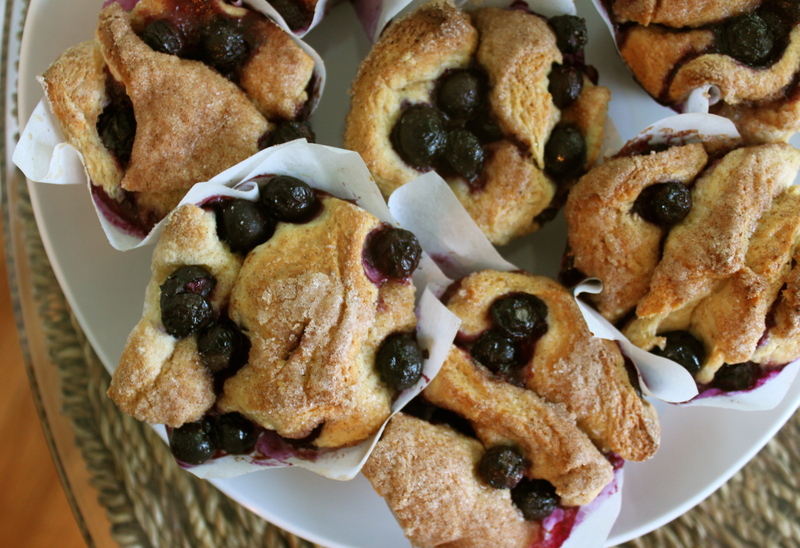 Isn’t the purple color of these Blueberry Pull-Apart Rolls just dreamy? I thought so too when I saw the loaf version of this recipe on Kitchen Corners a couple of weeks ago. So much so that I adapted them into roll-like form for the perfect sticky handful of sweet purple goodness. I find that individual muffin sizes often stay fresh longer and are a healthy reminder of portion control. But when can you honestly say the phrase “portion control” when referring to cinnamon coated yeast rolls? Anyway, these were a delightful addition to my Memorial Day weekend. The dough is extremely sticky – so don’t be overwhelmed – just dust your hands, countertops and elbows with flour before kneading. I also love the look of parchment paper in lieu of muffin tins – so sophisticated. I picked up the trick from Martha Stewart online. Mix 2 cups flour with brown sugar, yeast, and salt for 1 minute in a stand up mixer so as to remove any lumps.In a small sauce pan warm up the milk and butter and mix until the butter is completely melted. Add the cold water to the milk and butter mixture. Let it stand for 2 minutes until it cools down. Add the milk mixture to the dry ingredients and mix at medium speed for 1 minute.Add the eggs and remaining flour to the mixture and mix at medium speed for another minute. The mixture will be very sticky. Cover the dough with a wet kitchen towel. Let it rise until double in size. For the filling; In a large bowl mix together the white granulated sugar, cinnamon, and nutmeg. Remove any lumps. In a small bowl melt 1/4 cup unsalted butter. Knead the dough a couple of times. Add 2 tablespoons of flour if the mixture is too sticky.With a rolling-pin open the dough forming a rectangle; 12″ in height and 20″ in width. Spread the melted butter on top of the dough and sprinkle the sugar mixture on top of that. Add the blueberries. Make sure to spread out the blueberries so that it covers the entire surface of the dough. Cut the dough vertically into 12 equally sized squares. Layer the dough squares on top of one another in stacks of four. Place them into the muffin tins on their sides. Allow to rest for 20 minutes. Place the oven rack in the middle of the oven and pre-heat the oven to 350*. Bake for 30-40 minutes. For parchment papers (in lieu of muffin tins), cut parchment paper into 5 inch squares and press into muffin tins. Portion control? That’s unthinkable for those! I gained weight just reading this. Now let me at ’em so I can earn the weight! Blueberry on my cheeks, and blueberry and cinnamon sticky fingers, yum yum, finger lickin’ good! I am definitely trying this one!